Bed bugs are no longer a dirty little secret! In conjunction with our bed bug heat treatment services, Action also uses certified bed bug detection dogs to fight these bugs. Our bed bug dogs are trained to detect as little as one live bed bug in commercial and residential settings with unsurpassed accuracy—a rate human inspections alone can’t match! Our dogs can detect all stages of bed bugs before residents, guests, patients and customers. Dogs can detect through walls, floors and other areas that are inaccessible during traditional inspections. Getting rid of bed bugs before major infestations develop saves you stress, discomfort and money. Our canine detection team is certified by North American Canine Pest Inspectors, whose guidelines exceed those recommended by the National Pest Management Association for certified canine teams. 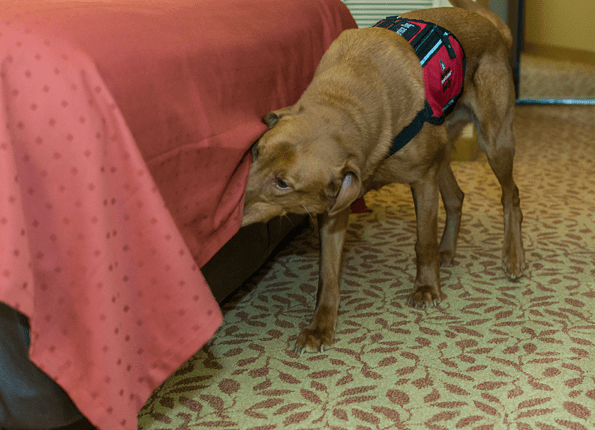 Our certified bed bug dogs are available to sniff out bed bug infestations in Louisville, Indianapolis, Evansville and Terre Haute, as well as throughout Indiana, Kentucky and Illinois. For more information on our bed bug dogs, please contact us today.